Today I will be starting a project that I haven’t done before – I will report from a rotation that covers four American countries in 10 days live. After every flight I will give you an update on what happened, what I did and there will be, of course, lots of photos and images so that you can see the world from my perspective. I will take you from Frankfurt to Atlanta in the United States and then further to Chicago, Mexico City, via Quito to Bogotá and then again to the states to Dallas, before I had back to Europe (first to Manchester and then Frankfurt). Day 1 of my journey start with me packing my bags at home and saying good-bye to my family. I originally planned to spend the evening with friends, but was called by our crews scheduling department yesterday. Our flight to Atlanta had been advanced by a couple of hours to a very early departure from Frankfurt, which means I have to fly to Frankfurt the night before in order to make it for my early bird check-in. 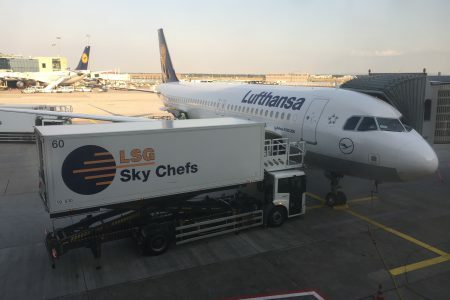 My flight on board a new Sharklet Airbus A320 of Lufthansa was uneventful (which is good), but slightly delayed due to bad weather in Frankfurt. Looking at the clouds as we passed them on our westbound flight, it became what the problem was – quite impressive if you ask me! There wasn’t much too be expected service-wise on this short 45 minute flight and that was fine for me. A salty snack was handed out to all passengers and free drinks were poured by the flight attendants. A still water was all I needed. On approach I could already see the hotel were I would be spending the night. As you can see, it is really close to runway 25R, but due to the night curfew at Frankfurt Airport it will be no problem to get sleep here. The older terminals in Frankfurt are certainly not the best-looking buildings in the world and the architecture is rather functional, but there is always a huge buzz of activity! To my surprise there was a long queue in front of the sausage stall – probably a couple of tourists that wanted to get a last taste of German Wurst. All that was left was to get my luggage and head for the hotel bus. Due to construction work going on all around the terminals the bus stop had moved (which created a lot of confusion among travellers) and there isn’t much space for it at the moment so people pile up there, but in the end it always works out. So much for now. So far my journey has not been that spectacular, but let’s see what happens. I hope to report back again in 24 hours from Atlanta, Georgia! Thank you for taking us with you on this journey. thanks for posting your amazing trip!!! waiting of course for the others in the future, always nice to reading your experience!